Once you've written your first novel, you want others to read your first novel. Traditionally, you try to find an agent and a publisher to stamp your book with approval and put it on bookshelves. That system has changed. The not-so-new trend is self-publishing. Readers help good books rise to the top over time. It is a decentralized meritocracy that skips the middle-man, promises greater control and flexibility, and offers a better royalty rate. Many have asked me how to do this, so I've tried to boil down dozens of guides and blogs into a few simple steps with a few useful links. 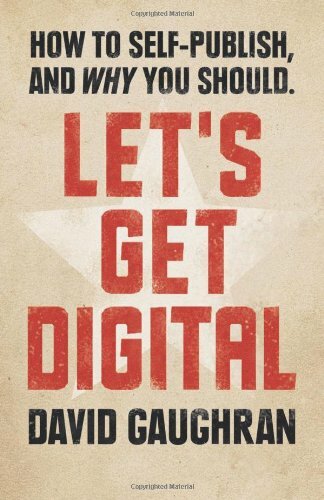 If you want to skip straight to the best book on the topic, you can't go wrong with Let's Get Digital. Click the cover below, spend the $2.99, and let the book prove its message. 1. Finish the book like a professional. This is really a pre-step, but it's critical. Traditional publishing can add an editing and formatting polish that many self-published books lack. Make sure your text is as close to perfect as it can be. This means an honest, sophisticated editor must review your book, whether you pay for that editing with money or friendship or canned goods. This also means good formatting, both for the eBook and print versions. Formatting is more difficult than you might think. In addition to this blog overview, I suggest using Scrivener and learning from this straightforward approach. 2. Acquire a cover that pops. You know an amazing cover when you see it. A fascinating presentation on the topic can be found here. I suggest either working with a high quality designer or setting up a competition through 99designs.com. Find a designer by tracking down whoever designed the covers you like. You can also find recommendations from other indie authors (like this guy). With 99designs, you explain what you envision for your cover and then let designers compete to create it. Whichever path you take, rest assured it is worth the investment to acquire a cover that begs to be clicked or opened. 3. Publish your eBook. This sounds simple because it is, or at least it can be. You can publish on a dozen platforms, but for your first book, I suggest the straight path of Amazon KDP. Amazon's website explains it all. Upload your book's text and cover, add a blurb and the genres, pick a price, and BOOM, you're a published author. But are you an author whose book is worth reading? Blogs like this and this have tips for how to game the system, but you can't win readers if you have not written a good book and done steps 1 and 2. 4. Publish your paperback. Amazon now owns a company called Createspace. Through Createspace, you follow similar steps of uploading your book's text and cover. This process takes time because of the formatting required to fit the paperback's size and other little choices and approvals. I vote for cream pages and 8-by-5.25-inch books. Createspace prints on demand for every Amazon author. You can also get cheaper copies as the author. After it ships, you'll feel warm fuzzies inside when you first hold the paperback in your hand. 5. Share, market, and keep writing. A universe of blogs and books tackles marketing. I learn more every day about it, and the prevailing wisdom changes with every shift of Amazon's policies. Right now, the most effective tactic is a promotional discount coupled with Bookbub (examples here and here). The best advice, however, is to write your next novel. Most first novels are not discovered, but if readers like your second or third novel, they may well go back and buy the first. Publishing multiple novels also builds your credibility and your skills as a writer. Focusing on your next book helps confirm that you are writing for the right reasons. You self-publish because you can, but you write because you love to do it. Make your words count -- J.B.